GATE 2018 CCMT Counselling Seat Allotment for NSR Round has been released on 23rd July 2018. GATE 2018 (Graduate Aptitude Test in Engineering) is an national level entrance exam for admission to PG courses in the field of engineering and technology. Candidates can get admissions into M.Tech./Ph.D. programmes in IITs , IISc, IISERs and other reputed institutions through GATE score. Every year, GATE is organized by the seven zonal IITs and an IISc on rotational basis. This year, GATE exam is conducted by IIT, Guwahati. Apart from granting admission, the score of gate exam is also considered as one of the criteria for recruitment to government and private organizations working in technical fields. Aspirants can check here complete details about GATE 2018 Entrance Examination. GATE 2019 Full Notification, Eligibility, Syllabus & other details have been released. The examination will be conducted on 2nd, 3rd, 9th & 10th February 2018. Check here for GATE 2019. GATE 2018 CCMT Counselling Seat Allotment for NSR Round has been released on 23rd July 2018. Check here for counselling details. GATE 2018 CCMT Counselling for NSR Round has been started from 4th July 2018. Check here for counselling details. GATE 2018 CCMT Counselling Seat Allotment for 3rd round has been declared on 10th June 2018. Check here for counselling details. GATE 2018 Qualifying Marks Cut-off for various papers has been released now. Check here for cut-off. GATE 2018 CCMT Counselling Seat Allotment for 2nd round has been declared on 28th May 2018. Candidates can pay the seat acceptance fee from 29th May to 1st June 2018. Check here for counselling details. GATE 2018 CCMT Counselling Seat Allotment for 1st round has been declared on 20th May 2018. Candidates can pay the seat acceptance fee from 21st – 24th May 2018. Check here for counselling details. GATE 2018 Score Card has been released on 20th March 2018. Check here for score card details. GATE 2018 Result has been announced on 16th March 2018. Check here for result details. GATE 2018 CCMT Counselling (choice filling & locking) can be done from 8th – 14th May 2018. Check here for counselling details. GATE 2018 Final Answer Keys have been released on 14th March 2018. Check here for answer key details. GATE 2018 Answer Keys & Question Papers (official) have been released on 19th February 2018. Check here for answer key details. GATE 2018 Candidate’s Responses have been released. Candidates can check their responses via GOAPS login. Check here for answer key details. Challenge against GATE 2018 Answer Key has closed by 23rd February 2018. GATE 2018 Admit Card has been released on 4th January 2018. Click here for admit card details. Note: Softcopy of Admit Card in Mobile Phones is not accepted for verification at the examination centre. Please bring a printout of the Admit Card (preferably in color) along with Original Photo ID. GATE 2018 Mock Tests for various courses are available for practice now. Click here for mock test & preparation tips. GATE 2018 Examination Schedule for various papers has been released now. Click here to view exam schedule. List of GATE 2018 Defective Application Rejected has been released now. Click here to view the list. List of duplicate GATE 2018 Applications rejected has been released now. Click here to view the list. Note: No further requests will be entertained for correction of particulars given in GATE 2018 application form. Note: Applicants, who have not verified the email address and mobile number during submission of GATE application, are advised to verify the email and mobile number at the earliest by logging into the GOAPS portal. GATE 2018 Application Correction in Choices of Examination City has been over by 17th November 2017. Click here for correction details. Requests for Correction in GATE 2018 Application Form are going on. Click here for correction details. GATE 2018 Application Correction in Gender, Category and PwD status has been over by 28th October 2017. Click here for correction details. Note: If the status of your application is “Under Scrutiny”, you need not worry. Wait till the scrutiny team processes your application. Only those candidates whose applications need to be rectified in photo/signature/supporting documents, will be contacted by email and SMS. The scrutiny process will continue even after the application portal is closed. GATE 2018 Registration Last Date has been over by 9th October 2017 (8:00 PM). Click here for registration details. GATE 2018 Information Bulletin has been released now. Click here for details. GATE 2018 exam dates have been declared now. Candidates may check official dates below. No common GATE 2018 counselling is conducted by IITS for providing admission to PG courses. Students have to apply individually to the IITs when the admission notification is released. NITs organizes the Centralized Counselling for M.Tech. / M.Arch./ M.Plan. Admissions (CCMT). It is the common counselling conducted by NITs every year. Counselling is purely based on GATE 2018 scores. The counselling registration has been started from 3rd April 2018. GATE Cut off marks decides the candidate’s eligibility for admission to IITs and IISc. It is the factor which decides whether candidates is qualified in the exam or not. GATE 2018 cut off marks varies stream-wise and category-wise. The cut-off marks for reserved category candidates are primarily low than the unreserved category candidates. GATE 2018 result has been published on the GOAPS portal of GATE website. The result has been declared on 16th March 2018. After the declaration of result, GATE Scorecards will be available for the candidates who secure marks equal or more than the cut-off marks. The qualified candidates are provided with a GATE scorecard which has the validity of three years from the date of announcement of result. GATE 2018 score card reflects the candidate’s performance in entrance test. The facility to download the scorecard has been provided from 20th March to 31st May 2018. GATE 2018 answer key has been released officially on 19th February 2018. Candidates can check the answer key via online mode. The answer keys for various papers has been released along with question papers. The authority has provided the answer key separately for each discipline. Answer key challenge facility is also open for payment of a nominal fee. Candidates are able to challenge the answer key between 21st to 23rd February 2018. The final answer key has been published on 14th March 2018. Question: What if I have not received my GATE score card? Or I have lost my GATE scorecard? Answer: GATE website shows how a candidate could obtain duplicate SCORE Card. For more details, please contact GATE office. Question: How many choices can a candidate give? Answer: A candidate can submit as many numbers of choices in order of preferenc e as she/he wishes from the list of her/his available choices. Question: How many counselling rounds will be there? Answer: There will be 3 regular rounds of counseling followed by internal sliding and physical reporting at the allotted institution. Finally one NATIONAL SPOT ROUND will be conducted for the vacant seats. Question: If I get seat allotment for admission, where should I report? Answer: You can report at any one of the Reporting Centre (RC) on allotment with in the scheduled time of the same round after paying the Seat Acceptance Fee. Question: Do I need to send the print-out of the application form? Question: How can I know the status of my application form? Answer: You can check the status of your application by logging into GOAPS website. Questions: How many times can I appear for GATE? Is there any age limit for GATE 2018? Answer: There are no limitations in the number of attempts for appearing the GATE and also no age limit. Question: Is there any negative marking in GATE 2018? Answer: There will be a negative marking of 1/3 marks for the questions carrying 1 mark. Likewise, for questions carrying 2 marks, 2/3 marks will be deducted. No negative marking for Numerical Answer Type questions. Question: What is paper code in the examination? Answer: As, GATE is held for 23 papers. Each paper has its unique paper code. For example – Paper code for Electronics and Communication Engineering is EC, for Chemical Engineering it is CH, etc. Question: Can I take the GATE through offline mode? Answer: No. GATE is only conducted in online mode. Question: What is virtual calculator in GATE? Answer: It is the online calculator which will provided at the time of examination. It contains all the functions and operators that allows you to do calculations. The virtual calculator will be shown on the computer screen while appearing the exam. Question: I have made mistakes in my name at the time of filling the application. How can i correct it? Answer: Correction in the application was allowed only in limited entries. Candidates can make the correction by sending an E-mail to their respective zonal GATE office. They provided the access to make the correction. Question: I want to change my examination city. How can i make changes? Answer: For changes in the examination city, candidates can make it during 13th – 17th November via GOAPS login. All the candidates have to apply online only. GATE registration 2018 was started on the 1st September 2017. The last date for registration was extended till 9th October 2017. The authority provides a period of approx one month for the application process. Aspirants have to fill GATE 2018 application form through GATE Online Application Processing System (GOAPS). Candidates have to register as a “New User”. After successful registration, they will get the access to GOAPS. Due to last minute rush, the mandatory verification of email and mobile number (before submitting the GATE application form) was relaxed. Candidates will be able to submit the application form now without verifying the email address and mobile number. Thereafter, they are required to login using GOAPS Enrollment ID and GOAPS Password. While filling the application form, students need to upload scanned photograph, signature, degree certificate or category certificate. Pay the application fee through online mode before the due date. However, candidates will be required to verify the email and mobile number later by login to GOAPS. Take printout of the application for further use. Application correction in exam city was started from 13th November 2017. It was done via GOAPS login till 17th November. Modifications are permitted in the GATE 2018 application form only in limited entries. Requests for correction in application form has been started now. The GATE application correction are allowed only after the submission of application form. In case, if any mistake has committed by the candidate in application then, he/she has to sent an email subjecting “Correction in data (Enrollment Number)” along with the document proof. Note: International candidates should have completed Bachelor’s degree in Engineering/Technology or Post-graduate (M.Sc.) degree in any relevant science subject.AT the time of filling the application form, students have to upload their proof of qualification eligibility. Students who have passed the qualifying degree in 2017 or before are required to submit the degree certificate/provisional certificate while the other candidates have to upload certificate from Principal/head of the institution. Course: GATE is conducted for M.Tech./Ph.D. programme in IITs , IISc and various other institutions. 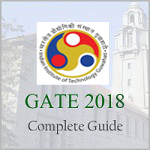 Number of Papers: GATE 2018 is held for total 23 papers. Candidates are allowed to appear in only one of the 23 papers. Section Common in All GATE Papers: General Aptitude (GA) section is common in all papers. It will contain total 150 questions of maximum 15 marks (5 questions of 1 mark and 5 questions of 2 marks). Negative Marking: There will be a negative marking of 1/3 marks for the questions carrying 1 mark. Likewise, for questions carrying 2 marks, 2/3 marks will be deducted. No negative marking for Numerical Answer Type questions. GATE virtual calculator is the online calculator which contains all the operations and functions for carrying out calculations. The virtual calculator will be provided during online examination. No physical calculator will be allowed in the examination hall. Students have to use the virtual calculator for solving Numerical Answer Type Questions. It is known that GATE is held for 23 papers. Syllabus for each discipline is different. For an effective preparation, it is important to know each and every topic from where the questions will be asked. It is hard to describe the complete syllabus of GATE in few lines. However, the students can download the official PDF of GATE 2018 syllabus for AE, AG, AR, BT, CE, CH, CS, CY, EC, EE, EY, XE, GG, IN, MA, ME, MN, MT, PE, PH, PI, TF and XL. Go through the syllabus of the paper for which you are preparing the exam. Plan your daily and weekly time table. Know your weakness and strength. Refer GATE Books that covers the entire syllabus. Most importantly, take care of your health. Admit card can be downloaded from the GOAPS website (link is given above). It will not be sent via email/post. The successfully registered candidates can download the GATE 2018 admit card from 4th January 2018. With the printed copy of admit card, students also need to bring one identification proof to the examination hall. Passport, PAN Card, Voter ID, Aadhaar UID, Valid College ID, Employee identification card or Driving License. From international students, only valid Passport/ Government issued ID/College ID/ Employee ID will be accepted as ID proof. If candidates have any query regarding GATE 2018, they can leave their comments below. syllabus is same as per the last year. I competed M.sc computer science and statistics in 2014. Can i give GATE exam. I have completed my B.E. in 2016 and appeared for the GATE2016. Now i want to appear for GATE2018, am i eligible for the GATE2018? I need 2018 civil syllabus …in Gate. Sir, I need 2018-Mech syllabus…. I want gate syllabus 2018 for mechanical branch.. I am studying btech 2nd year. Can i appear in gate 2018 i will be in btech 3rd year at that time?? You can appear when you will be in the final year of your graduation. I have completed Bsc(IT) in 2004. Please let me know my eligibility for GATE 2018. I finished my Bachelors in Chemical Engineering with MBA (dual degree) from India in 2015 and I am now pursuing my Masters in Chemical & Petroleum Engineering from Canada. I will complete my Masters in December this year. Am I eligible? If yes from where (Indian University or Canadian University) should I take permission while filling the application form? I need syllabus, date and application form. I am 3 rd year student. Can i give GATE exam. what is the best reading books for gate(civil enn.)? Model and last year papers will be more beneficial. my kid present studying ECE 6 sem. in NIT , which year appearing gate examination. please inform me for gate coaching/preparation. how many marks to qualify gate2018????? is mtech are 3yrs in 2018 onwards?????????? I completed my M.Tech in 2017 successfully …but I didn’t get my degree certificate yet from our clg…. In such case, can I apply for GATE 2018 with my B.TECH degree certificate?? Thanks in advance. Is it required 60% in graduation(BTech) for attending the Gate Exam ? Will my CGPA that I’ve obtained from college affect my cutoff for IITs.!? Hi I am 2nd year btech student from this june 2017 I will be pursuing 3rd year am I eligible to write gate 2018? any charts or graphs…are allowed?? sir , can you please mention previous years cut-off’s for mechanical engineering stream to be eligible for NAVARATNA’s or please send us a link regarding that . At present I am doing Third year B.E(CSE).Whether I am eligible to apply GATE18? I completed my B Tech in 2010 and working in Automobile company since 5 years. Can I apply in BHEL thru Gate?. I am a B.E mechanical student,I want to know how much expected cut off to join IIT’s &NIT’s through gate exam. Sir, i done BSc, M Sc in biotech in 2007 and later done M.Tech in Food Processing and Technology in 2010 – 12 i want do Phd in Food Tech only, can u suggest me where can i do Phd research work in food sciences. and can u help me to update the Next GATE notification and Syllabus for Food Science. Sir, i had completed b tech in 2016 and now working in saudi.now i wish to attend gate 2018.can i apply from here? I will get negative score in gate 2017 as per given reference key of iit institute…is get admisson for ME ??? may i know which institution will conduct question paper 2018? what will be cut off count for international student ? Will he count within general or have different cut off point? A student from Nepal studying B.Tech in India ,will he count as international student? can i give gate exam in 3 rd year? Which University Conduct 2018 Gate paper ??? Which University Conduct 2018 Gate paper ? It will be decided later. Will be given on this page, but on time. just fill the enquiry form given in the article and we will update you through email. I have passed MCA in 2007. Can I go for GATE 2018. Am I eligible for this? yes, if you have completing your UG or pursuing the last year.